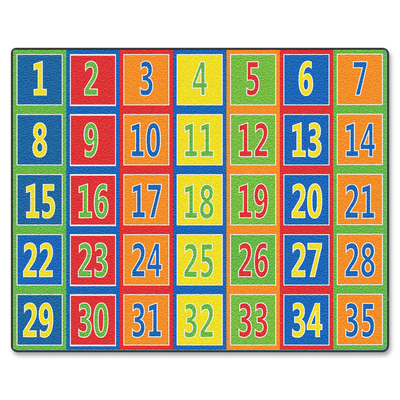 Numbered Rug Reinforces Number-Recognition Skills While Providing Organized Seating In Your Classroom. Colored Squares For Each Number Offer Children A Sitting Spot And Can Be Used To Divide Your Class Into Groups. High-Quality Print Is Manufactured At 625 Dpi For Crisp, Detailed Images With Excellent Definition And Clarity. Antimicrobial Treatment Helps You Maintain A Germ-Free Environment By Guarding Against Odor, Mildew And Mold. Scotchgard Protector Resists Heavy Soils To Quickly Clean The Rug In The Event Of An Accident..
Numbered Rug Reinforces Number-Recognition Skills While Providing Organized Seating In Your Classroom. Colored Squares For Each Number Offer Children A Sitting Spot And Can Be Used To Divide Your Class Into Groups. High-Quality Print Is Manufactured At 625 Dpi For Crisp, Detailed Images With Excellent Definition And Clarity. Antimicrobial Treatment Helps You Maintain A Germ-Free Environment By Guarding Against Odor, Mildew And Mold. Scotchgard Protector Resists Heavy Soils To Quickly Clean The Rug In The Event Of An Accident.